Posted: Tue Jun 02, 2009 4:45 pm Post subject: Re: phone or pc? Phones for me, and I suspect most people using thin clients are using them to hook up phones. Once the thin client is set up correctly, you can remove the monitor, keyboard and mouse - leaving just your magicjack plugged up and the phone plugged into it. I'm sure you could use the softphone, but that would be about all you could run on the thin client. 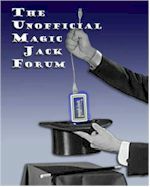 Probably a good idea to get more familiar with thin clients and embedded operating systems (particularly XPe) before you start installing magicjack on one. Posted: Tue Jun 02, 2009 7:44 pm Post subject: Re: phone or pc? My setup is with wired and cordless phones. The MJ is a second phone line for me. if anyone can help me out I'd be grateful. I have the MJ installed on my TC 5700, however I cannot select "telephone" under the communications options. I did the who RDP change settings so that it does not make any changes to audio to the TC, but I cannot select "telephone" radio under device. ...however I cannot select "telephone" under the communications options. any ideas/thoughts/comments? Download and Install USBAudio driver? Try that and the telephone settings may appear, you may still be missing the audio. MJ 5700/256/256 works just fine here, thx for the details instructions provided in this thread. Thx to all who contributed. Need more "HDD" space and cannot uninstall the messenger using the instructions given here. There is some DOS coding given somewhere in the thread but doesnt work for me. Can anyone help here? I have The 5710 256/256 and SP1. Is it even possible to get this to work? I cant get the phone to ring or work when plugged in. It wont switch to telephone mode. Same here...does anyone that setup their T5700 last year happen to have the original Altiris script to uninstall Messenger? It is a dead link. I also can't find them, it seems HP has removed them. Posted: Thu Dec 03, 2009 3:46 am Post subject: Re: phone or pc? I'm using a 2-line phone. Land line is line #1, MJ is line #2. To make a long distance call, I press line 2. The phone also can connect both lines for a 3-way conference call. For headset, I have a wireless Plantronics telephone headset (plugs into phone handset jack). This part was a life saver for me! Everything worked buy my phones and this little download immediately fixed it! Thanks!!!!! The problem with the instructions on Bay-Wolf is that at one point they want to know the location of the Win98 DOS files and I DONT have any Win98 DOS files, I am running XP. What do I do then??? Did you already install the USB Audio drivers and commit the changes? You will need them for the handset to work properly. As far as the "download in progress" issue, unplug the mJ, reboot the TC, double check Device Manager to make sure you are not missing any drivers (specifically network adapters), plug in the mJ, check for missing drivers again. You may need to enable flow control on you network adapter as well. If all is well, it should finish the download fine.